Great news for iPhone lovers. 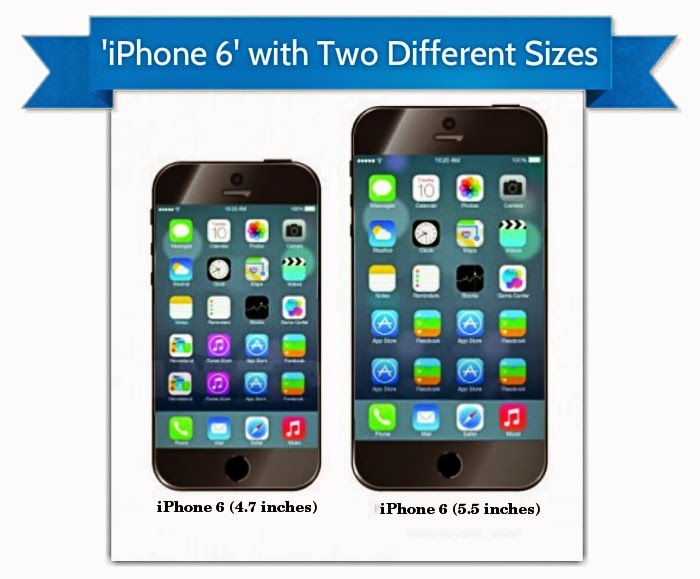 Now, one can get 'iPhone 6' with Two Different Sizes, i.e. '4.7-inch' and '5.5-inch'. Read this post and get remaining the information about both sized device, including release data and other specification. According to some rumors, Apple’s iPhone 6 is probably to come in super-slim version that features a 4.7-inch display and its second model with a 5.5-inch screen to be launched later. It has long been thought that the global trend for larger screens would be followed by the next iPhone, while the release of two separate models could help Apple service to multiple markets. We have seen the success of Phablets, handsets with screens of 5.0-inch and up in Asian-Pacific markets with Smartphones like Samsung’s Galaxy Note series that comes with a 5.7-inch screen. With the recent launch of the HTC One (M8), we have seen the ‘regular’ flagships that have been moving in the same direction that confirms the trend with a 5.1-inch screen. Currently, the screen size of the iPhone 5s and 5c is 4-inches. It is supposed that the latest iPhone 6 will release in September and will come with amazing feature like in-cell touch panel technology that simply means it integrates into the screen rather than overlaid on top of it. With this, we find a thinner construction and have led to comparisons between as-yet unannounced iPhone and Apple’s iPad Air, which launched last year with a slimmer profile and lighter weight. But, it is also thought that the difficulty of developing this in-cell technology suggests that the mass production of the larger 5.5-inch screen size is probable to begin many months later. It is one of the essential steps to transfer the 4-inch display on the iPhone 5, 5s, and 5c to 4.7-inch display. Moreover, Samsung's flagship Galaxy S5 comes with a 5.1-inch, 1,920-by-1,080, 432-ppi display that DisplayMate called "the best performing Smartphone display that we have ever tested" that has "raised the bar for top display performance up by another notch." Thanks to mobile application that helps to make life simpler. The way we are doing business, communication, shopping or chatting, all things can be done easily with various mobile applications. We have seen a continued rise in mobile devices like tablets and smartphones and thus, the demand for application also increases in the great extent. Users are more giving more importance on clear and attractive images while developing an iPhone application in 2013 and the trend will continue this year also. The major trend for mobile application is to use streamline grid layouts that focus on particular images, avoid stuffing the screen with pixels and unnecessary animations. Throughout 2013, a simple and clean interface in iPhone application design has been demanded and it is also expected that this trend goes demand in 2014 also. Such trends have been arises unnecessary functionalities and keep it very simple. There are many applications showed the trends that keep interfaces simplified instead of being modernized by adding stylish colors. There is good news for iPhone app users. Now, it can simply move to cloud computing that means you can run your application on the Internet other than the businesses' own servers. There are many benefits of this, the first one is it enhances the lifetime of the mobile application. If you are deploying iOS application to clouds, it enables developers to focus on higher-value activities and helps to cut costs in many different ways. There are huge possibilities seen in iPhone apps for creative interaction. Some of the examples are using gestures for sharing photos, bookmarks and contacts. We have many applications that started with an interface resembling familiar hardware. Such type of application comes with shiny exteriors and familiar interfaces that allow users to connect instantly. Furthermore, the elements of such mobile apps are breaking out of the conventional iPhone UI that takes the benefits of the device's unique ability by responding finger gestures. Geo-Targeted Advertising is the latest trends for 2014. It is used for targeting users by their specific geographic location. One can also optimize ad campaigns geographically by using such functionality. There are some hottest trends we are going to see in iPhone App Development Services in 2014. No iPhone game developers, who don’t face any complications while developing games. It is never an easy-to-go job even you have years of experience and expertise in particular technology that required for developing games. You have heard about games like Candy Crash and Angry Bird and also wondering how it becomes so popular among players. Well, it’s not about luck; you have to use some exceptional tips to make your game more interesting and productive. Here are some tips for novice developers to create an eye-catchy game. No doubt, thousands of games are available at the App store and thus, designing unique game is one of the tougher tasks as one should have to consider all the essential factors. As you have to consider issues related to coding so, it is must to be ready with proper solution and draft sketch of how to proceed with your customized plan. It is must to follow basic principles irrespective of the complexity of the game you are considering while developing game. If you are novice or doesn’t possess enough knowledge of latest technologies then going through online courses is one of the excellent options. Learning basics of development process helps you while iPhone game development task. Ensure to have sharpened skills and detailed information about platform you are going to develop game before plunging headlong. We all know that developing latest iPhone game is a challenging task although you can have option to enhance an existing game and develop a new version by putting skills together. For iPhone Game Developer, it is must to sync with the latest developments in order to implement such technologies in their development plan in the most efficient ways. Ensure to gather information about technologies like 3G and languages like C++ to clear your role as a developer. It would be great to take help from open source software manuals, if you don’t have clear idea about the coding systems. Open source software manuals can be downloaded from the Internet or subscribed at nominal costs. If you are finding expert and experienced developers for iPhone game development task, hire iPhone Game Developer from us with flexible pricing packages. In this modern technology world, every new and then person looking to try their hands on something developing like developing applications, games and many other types of apps for smart-phones. However, Apple’s iPhone is one of the most popular devices in the market that caught the attention of almost people worldwide. If you have also decide to develop iPhone game to make your career or you just want to try your hands, there are lots of things that you should avoid while developing your game for iPhone. To make your task of developing easy and worth, here I have listed 5 don’t of iPhone game development that you should strictly avoid while game development task. First and foremost point that you do not have to do while developing an iPhone game is doesn’t copy other obtainable games. You can take inspiration from other games, but you cannot copy other games. You always have to try to develop something unique and exclusive so that players find your find interesting. If you use your unique idea in the game, it will help you to stand-out from other game developers. At the time of developing iPhone game, you don’t have to stop developing or give-up with developing of game. It is one of the most important don’t that takes lots of commitment and drive to develop games independently. No matter how many difficulties you are facing while developing your game, but you don’t have to stop developing and amazing experience. No doubt that you can made money on the App store, if you game is compelling and attractive for players. But it is not always possible with everyone as sometime it can lead to disappointment as well. You should focus on developing an excellent game and get it in people’s hands. The money will automatically lead towards you. You know that marketing part for iPhone game is very much important as it can help you to make your game more and more popular among players. There are lots of people, who stop doing marketing at the end, but they don’t have to stop doing marketing of their game. Before you game launches, you need to build anticipation and then get as much as exposure as possible. It is one of the major truths that you can always learn something new and unique. So, you don’t have to stop learning as you can constantly learn some new things and grow your skills and the quality of the games will be improved. There are lots of people, who have a regulation at which they shine, but you should try to learn little bit more and more. You can also grow your skills by working with other people as you may know something very interesting. So, these are some of don’t of iPhone game development that you should avoid while developing game for iPhone. However, if you find all this task of developing game hard and irritating, you can also hire professional iPhone developer, who can develop any type of game for your iPhone. Last August, after losing Chromecast support, AllCast is back once again that allows its users to stream local pictures, videos and music from their android device to their Chromecast over Wi-Fi. After a huge tribulation, finally Koushik Dutta’s AllCast application has been launched officially that is compatible with the Chromecast. All thanks to Google’s release of the Google Cast SDK that has been released yesterday. Koushik Dutta was one of the first developers, who offered an application that could send pictures, music and videos to the Chromecast, but Google put the kibosh on it since lots of applications were only believed to work on whitelisted Chromecast devices. When it comes to AllCast application, it offers users with something of an AirPlay like experience for streaming music, pictures to your TV through different devices like Roku, Apple TV and now it also works with Chromecast again. As we all know that in the month of August, Google purposely broke AllCast by releasing a Chromecast update that stop video playback support, said by Koushik Dutta. When firstly Google clarified that the SDK was in developer preview and numerous transitions were still to come. At the time the SDK wanted to be for official testing only, not independent efforts such as AllCast app. Till today, Chromecast has worked with some android applications such as Hulu Plus, Netflix, Pandora, YouTube and some others. Even without the Chromecast support, the development of AllCast continued, and finally the application exited from beta in the month of December, enabling all the users to stream from Android devices to Apple TV. Moreover, the AllCast android app supports with DLNA streaming and today it also works with Xbox One, Samsung, Roku, Panasonic Smart TVs and Google TVs. Users are also able to stream their content from Dropbox or Google Drive or from any local device that has SD cards. To do such kind of things, you have to launch an application and have to pick your destination and then media you want to stream. AllCast is one such app that automatically detects and lists your compatible file types. On Google Play, this updated application has been live, so users can easily download this application and get numerous benefits. For AllCast to work with ChromeCast, users will need Google Play services 4.2, and Google also declared yesterday that the latest release began rolling out to Android devices worldwide on Monday. So, android users can easily download this application; however, they can also find many more android apps that are Chromecast supported such as Avia, Google Play Movies & TV, HBO GO, Hulu Plus, Netflix, Pandora and many more. Users can also hire android application developer, who has wide experience in developing android apps as they can get their desired apps that support with Chromecast. Here, we are familiar to develop chromecast supported Android applications as per your requirements as our team of developers have extensive knowledge of developing android apps that are chromecast supported. So, if you want to get android app that supports chromecast, you can hire android developer from us and get an application that has your desired feature. Since inception of iPhone, a steady increase in the number of applications has been noticed as all the people worldwide are looking for some feature-rich and robust quality iPhone applications that are built amazingly. These days, Apple is enjoying a great success because its devices are greatly appreciated by people worldwide. As per the recent survey, we came to know that the shipment of iOS devices has tremendously grown over the past few years, and most of the iOS device users are looking to enjoy their desired application to make their day-to-day life easy. However, lots of businessmen globally are attracted towards iPhone application development as iPhone apps can make their business transactions a lot easier than before. No matter whether they are at home, office or any other place, they can perform their transactions exceptionally and make their business more powerful. Along with it, they can also their customers to use application on their device to get more information about products and services. Using iPhone application, it becomes easy for your customers to get product information anytime and anywhere. This way, they become more familiar with your company and become your trusted patrons. As we all know that iOS is one of the most powerful and secure mobile operating systems that widely used by people globally. Today, iPhone application development has been embraced by lots of applications developers as they are entered in this market to develop some astonishing and outstanding quality applications. Developers are also able to develop special business applications to grow your business. Being the most secured OS, various businesses are going with this platform to make their business most popular. Why Use iPhone Development Service? Currently, Apple app store is one of the biggest app stores that contain all types of applications including business, education, gaming, multimedia, news and more. Apple’s iOS is one of the most secured platforms that allow people to enjoy best and secured applications without any hassle. The best part of this OS is that the company is coming up with constant updates to the iOS so users can enjoy many new features and developers can also develop applications more uniquely. These are some of the common reasons that businesses should go with iPhone application to expand their business and its services. A complete IT solution provider mainly in business of iPhone App, iPad App and Android App development solutions.